10-year-old Bear was put down after he broke his shoulder. A Halifax man says had to euthanize his dog after the dog fell in a sinkhole in a city park. He is now calling out the municipal government for not doing more to keep the city's dog parks safe. In a Facebook post, Mike Goneau wrote he is holding the Halifax municipal government personally responsible for the loss of his 10-year-old dog. Bear broke his shoulder after he fell into the sinkhole, and his vet determined his recovery wasn't guaranteed because of his age so Goneau made the difficult decision to put the dog down. 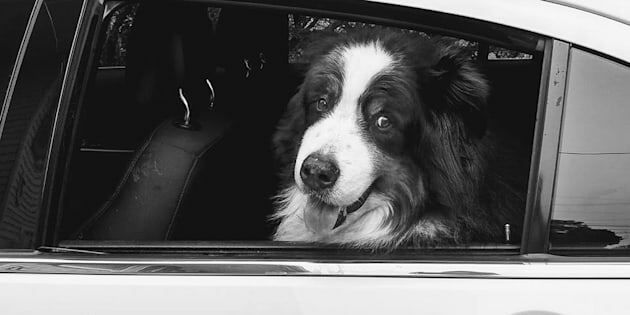 "Instead of all the wonderful memories of Bear's time in my life and a future that still includes him, I get to relive the last three hours of his life, hearing him wail, whine and cry like no animal should, carrying him to the car as he bit me, laying on the floor with Bear and crying into his fur while knowing all the work that the doctor was doing would be for naught," he wrote. He went on to say the city's councillors and mayor needed to show leadership and demanded the city take action by making Mainland Common Park safer. He also asked for the city to reimburse him for the money he spent trying to save Bear's life. Goneau added he was investigating whether he could charge the city with animal cruelty or endangerment. Other dogs have been injured in the park before, CBC News reported. Dog owners had met with city councillors in the past to share their concerns about the sometimes waist-deep sinkholes. HuffPost Canada reached out to Halifax city council over email and was told there weren't any open service requests for the park when the incident took place. Brendan Elliott, a Halifax senior communications advisor, said the park had a history of service requests but they had all been closed and therefore resolved before Bear's accident. "We have repaired three sinkholes in that park this season. They were repaired between June 3 and June 8. We're investigating what is causing these sinkholes. We're bringing in an engineer later this week to try and help us figure out what's causing the depressions and sinkholes," he added. He also advised people to call 311 if they noticed any potential hazards in city parks. "Many people observe dangers, and even go so far as to say someone should fix something, and may even comment on it through social media. But the only way we can know for sure that there is a problem is if someone opens a file through our 311 service," he added. Temporary fencing (yellow) was put in place yesterday that will barricade the park's hazardous areas from dogs and dog owners while keeping the remaining dog park and wooded trails open. Fencing was put up around the sinkhole and the rest of the dangerous area on Monday while the city works on a long-term solution, Elliott told HuffPost, adding that the current strategy is to fill existing holes and prevent new ones from forming. The city is also considering closing the park every Wednesday from 1 to 3 p.m. to deal with maintenance. "A longer-term strategy has already been discussed for capital budget consideration for 2018 that includes exploring alternative surfacing options, potential drainage improvements, and provision of shade," he added. Elliott said the city only found out about the sinkhole that led to Bear's death on Monday after the accident happened. "What happened to Bear is tragic. I too have faced the devastating circumstances of sitting on the floor of a vet clinic while I watched my best friend go to sleep for a final time after being at my side for almost 13 years. I can assure all users of the dog park that we will do everything in our power to make sure the park is safe for all users."